I can now confidently confirm that palak (spinach)/saag (leafy greens) paneer (cottage cheese) is the most popular Indian dish abroad, because I haven’t met a single non-desi in the last five years who hasn’t asked me if I have an authentic recipe for it, unless they were vegan, or lactose intolerant, or just blissfully unaware of the existence of paneer–an unaged, non-melting farmer cheese (and the only Indian cheese!!). Alright, I may be exaggerating just a little bit, but that’s what I see everyone eating all the time in the Indian restaurants here anyway. No?? Okay. Fine. But even if that observation is inaccurate, I myself make and eat this dish all the time. And any repeat recipe in this house is a special one. So, I thought you might enjoy it. Unless you are an aspiring cheese maker, or have endless time and patience, I don’t see why you should need to make your own paneer. All Indian groceries always carry paneer. Just look for one near you. Use the non-fried, non-cubed versions if possible. You can easily substitute paneer for tofu, or use regular cottage cheese. For this particular recipe I have used frozen spinach, but by all means use freshly blanched spinach if you like. 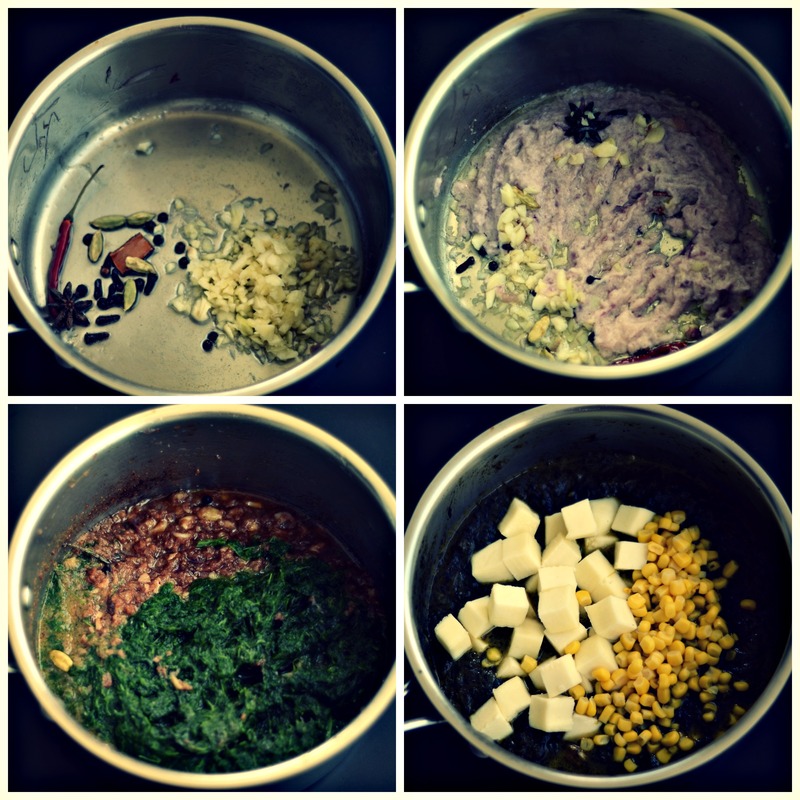 I have also added corn to this recipe, because they add a textural contrast to the soft and creamy paneer and spinach, and also look pretty like jewels. Heat oil in a pan and add the whole dry red chili, cardamoms, cinnamon, black peppercorns, star anise, cloves, and cumin seeds. Give it a stir and add chopped garlic. After about thirty seconds add the onion paste** and green chilies, and sauté over medium heat for another 2 minutes. Add the spinach* paste and adjust salt. If required add some water. Cook over medium heat until oil separates, about eight to ten minutes. Next, add the diced cottage cheese and corn, cover and cook for about two minutes. Turn off heat and stir in fresh cream. Serve hot over rice or with naan. Tips and tricks: Cook spinach over medium-low heat while stirring continually to prevent it from sticking to the bottom of the pan. **This recipe calls for onion paste (although, not traditionally used in palak paneer), but in my experience raw onion paste tends to turn bitter if not cooked for long enough. Therefore, I like to first sauté the onions for 10-12 minutes over medium heat, or until it turns golden brown, and then make a paste. It reduces the cooking time considerably, and adds more flavor and sweetness to the dish. Alternately, you could also cut the onion into four pieces and soak them in hot water for five minutes before making a paste. *If you are using fresh spinach, you will need to blanch the spinach first. Bring a pot of water to a boil, remove from heat, immerse the spinach leaves and let sit covered for 2 minutes. Refresh with cold water to stop the cooking process. Blend the spinach using a food processor to make a smooth paste using as little water as possible.